Queensland Health Minister Steven Miles says he is appalled by an anti-vaccination billboard on Brisbane's northside and his department is investigating whether it can be removed. 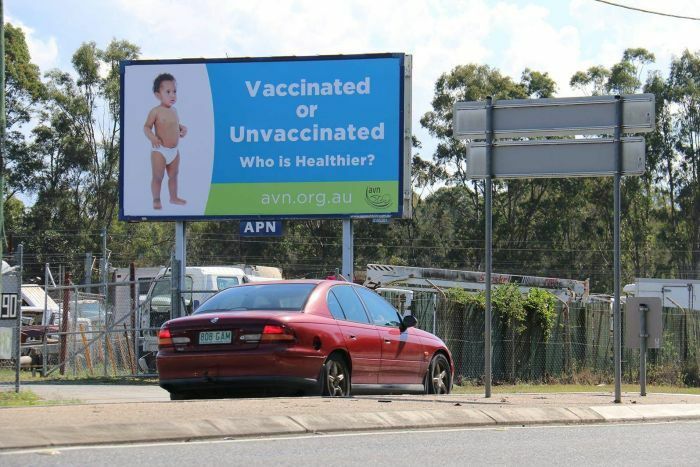 The large sign on Beams Road at Carseldine reads: "Unvaccinated or vaccinated, who is healthier?". "This isn't free speech — it's fear speech," Mr Miles said. "Promoting and publicising this kind of rubbish puts kids' lives at risk. "Vaccination is safe and it's effective — it is the single biggest and best public health intervention in a century." The group responsible, Australian Vaccination-risks Network Inc., said it paid for the sign and was "extremely proud" of its impact. But Mr Miles said the billboard was deceiving parents. "Obviously everyone is concerned for the health of their children but the healthiest thing any parent could do for their children is to get them vaccinated," he said. "For people to be spreading this kind of fearmongering is bad for public health and ultimately bad for the safety of our kids." A spokeswoman for Ad Standards — the advertising industry's self-governing body — said while it had received a number of objections, it had no jurisdiction over the subject matter. "The complaints received about this advertisement will not be considered by the Ad Standards Community Panel as they do not raise an issue under the codes and initiatives administered by Ad Standards," she said. "Ad Standards has assessed the billboard as advertising about a political issue. "Advertising about political issues is outside the Ad Standards charter as, in our view, it is not possible to make decisions about whether a political advertisement breaches the code without the potential for being seen to be taking a political viewpoint. "Complaints may also be directed to the local council or local Member of Parliament." Several thousand Brisbane motorists pass the billboard every day. The billboard itself is owned by APN Outdoor, which has previously run advertisements for Queensland Health. A Queensland Health spokesman said the department had raised the issue with the company. "We've received complaints direct from the public asking us to take action," the spokesman said. "I'm concerned Queensland Health might be seen to be doing business with companies profiting from fear." Mr Miles said inquiries to both APN and Ad Standards had not resulted in action to remove the billboard. "Both of those inquiries haven't resulted in the billboard coming down as yet but I'd certainly call on APN, the billboard company, to do the right thing — to remove this billboard and replace it with one that tells people the truth," he said. "They should replace it with one that tells people that the best way to keep your kids safe is by keeping them vaccinated." Mr Miles said the department's lawyers were also looking at other options. APN Outdoor has been approached for comment. MP Steven Miles are you attempting to stifle and silence FREE SPEECH??? What is WRONG with a billboard portraying a toddler and a question? How is it fear speech or fearmongering MP Miles? How is the billboard deceiving parents? Talk about the pot calling the kettle black MP Miles! Don't politicians deceive their constituents and the public everyday? "Vaccination is safe and it's effective..healthiest thing any parent could do for their children is to get them vaccinated" - Where is the IRREFUTABLE PROOF? Why don't you want people who can think for themselves and make informed decisions? Why is this so threatening to you? What do you personally and commercially stand to lose? Do you have an interest or share in the vaccination companies or their affiliates? Or is it the profit from business contracts you might miss out on? What do you know about the truth MP Miles? MP Steven Miles the public would like you tell us the truth - the whole truth and nothing but the truth. Not only about vaccinations but full transparency about everything the Qld government does, including true figures on assets, revenues and expenditures. The true figures of the real accounts, not just silly old budget figures either. "Health Minister wants it taken down" -- The public wants MP Miles to resign from Office.